July 27, 2011  This week, the United Automobile Workers is kicking off negotiations with Detroit's Big Three automakers. The round began with Chrysler on Monday. Wednesday, negotiators had their ceremonial handshake at GM. The same will happen at Ford on Friday. July 26, 2011  So, what do you want to drive when you grow up? It's a question that's important to car companies trying to tap into the youth market. Kids develop strong ideas about brands as early as kindergarten — and automakers are taking notes. 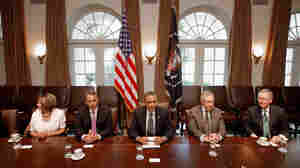 July 21, 2011  The United Auto Workers union begins contract talks next week in Detroit with the Big Three automakers. 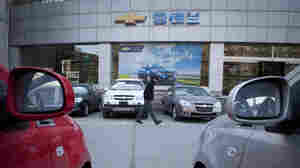 It will the first time since the economic collapse that the car companies and the union have sat down to work out a deal. July 19, 2011  If you take away the politics and talking points from the debt-ceiling showdown, you end up with something that looks a lot like a Texas Hold 'em poker game. Both sides are posturing, taking risks, making big bets and, of course, bluffing. July 2, 2011  It's Day 2 of Minnesota's state government shutdown. No negotiations are expected until after July Fourth, and with state parks closed and government offices shuttered, many Minnesota residents are already restless. 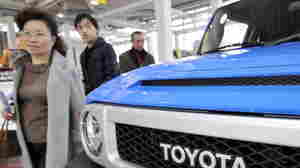 June 30, 2011  Experts say Toyota markets to minorities better than any other car company. And it shows: The company's tailored ads bring in about 19 percent of black buyers, 22 percent of Latino and Hispanic buyers, and 33 percent of Asian-American buyers. June 24, 2011  Dramatic losses in construction and manufacturing have led some economists to dub the downturn a "man-cession," saying it hit men worse than woman. And it's been even harder on black men, whose unemployment rate is about double the national average. Economists don't see a big improvement soon. June 24, 2011  The U.S. auto market is slowly rebounding. But even as sales rise, they're still off the peaks of 10 years ago, by some 5 million cars a year. Many analysts and dealers say the industry is actually healthier now, when it's selling fewer cars. 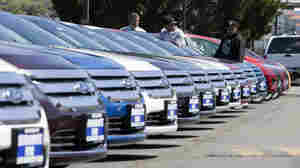 Japanese Carmakers: Ailing From An Image Problem? June 21, 2011  When a massive earthquake and tsunami hit Japan earlier this year, the auto industry felt the impact almost immediately. Even American carmakers were forced to shut down plants because of part shortages. Many worried the devastation would have a lasting effect. But the car shortages many predicted aren't nearly as bad as expected. The problem is convincing American customers that the carmakers are ready for business. June 14, 2011  General Motors is about to surpass Toyota in sales. That's after Toyota cut its sales projections following supply chain disruption because of this year's earthquake and tsunami. The last time GM beat Toyota worldwide was in 2008. June 9, 2011  With falling demand in the U.S., American auto companies are finding that business is better abroad. Growing middle classes in Brazil, Russia, India and China are providing new markets for cars that U.S. automakers are eager to fill. June 4, 2011  Analysts point to the company's success as a sign of the increasingly competitive nature of the U.S. car market. An underdog in the auto industry, Hyundai seems poised to pull an All About Eve on Toyota's Bette Davis. May 27, 2011  As rescue efforts in Joplin, Mo., wind down and clean up begins in earnest, tension is building. Residents have become upset by the lack of information about missing persons — and over attempts by the local government to control the disaster area. May 26, 2011  In Joplin, Missouri, victims of the tornado are beginning to put their lives back together. 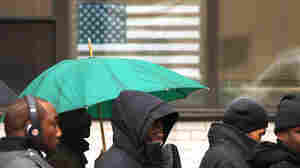 Insurance companies are already making visits and paying homeowners for their losses. City officials are making temporary contractors obtain licenses to cut down on fraud.